Indie game developer Chris Chung has really done it now. Just look at this mess! Ahem, I mean, he's created the video game Catlateral Damage, about a dickweed cat that breaks its owners stuff. I recently got a hold of Chris and he was kind enough to answer a few questions about who exactly is going to clean up this mess!? I mean, the story behind Catlateral Damage. How would you describe Catlateral Damage? Catlateral Damage is a profound representation of the existential crisis the average domesticated house cat may experience at any given time in its lifetime. Actually, it's just a fun little physics game about breaking lots of stuff from a mew perspective. When I was growing up, my family always had at least 2 cats (and at max, 5). You could say I was partially raised by cats my whole life, and I may actually have feline blood in my DNA from all the scratches. I also love classic video games where the focus is on gameplay and what/how you can perform within the constraints of the game rules. So, put those together and you get a game where you play as an acrobatic cat who doesn't understand the concept of points but still tries to get as many of them as possible. I'm definitely not a Unity expert and my coding skills are pretty lackluster, so there's a lot of learning involved. Most of the difficulties I've had are figuring out how to make the paw(s) do what I want. I know there are also some bugs in the messy player controller code. The internet is a great place for finding answers to common Unity issues though! At one point I showed the game to another developer I used to work with and he asked if there would be some sort of combo system. He then mentioned the Tony Hawk's Pro Skater games and it suddenly gave me a bunch of new ideas. I loved the THPS games growing up so I don't know why I never made the connection. The current combo system in my game emulates that of the THPS games, and I hope to add some more similar throwbacks like collecting secret objects or completing silly level-specific goals. What aspects of the game are you excited to implement in future builds? I'm really excited to implement new game modes. A "free" mode is something that has been suggested frequently, which is similar to the current game mode but without a time limit. There's also a "Cat Ops" mode in the works that involves knocking over things at night without waking your owner. Of course, there will be cat night vision. I also can't wait to make all new and different levels for cats to be jerks in. Tell us what the back of the box for Catlateral Damage would say. 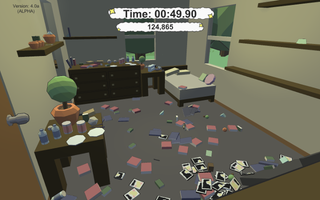 "Catlateral Damage is the premier first-person cat simulation experience! Run around as a typical house cat and feel what it's like to have zero responsibility for your destructive actions. Show those humans who the real boss is by using the power that flows through your little paw pads. :3"
Play Catlateral Damage here, and vote for it on Steam Greenlight over here.